An unseeded trio of former American college stars advanced to the quarterfinals with impressive victories today at the WTA 125 event being held this week in Indian Wells. Jennifer Brady(UCLA) defeated No. 2 seed Alison Riske 6-3, 7-6(4), while Nicole Gibbs(Stanford) ousted No. 9 seed Taylor Townsend 6-1, 6-1 in under an hour. Gibbs and Brady will play Friday for a spot in the semifinals. Di Lorenzo, who has recently returned from a foot injury, didn't beat a seed, but for the second day in a row, the former Ohio State Buckeye dropped the first set 6-1, yet fought back for the win. Today it was former WTA No. 9 Timea Bacsinszky of Switzerland who was unable to hold off Di Lorenzo in a nearly three hour contest, 1-6, 6-2, 7-6(4). Di Lorenzo will face No. 11 seed Zarina Diyas of Kazakhstan in the quarterfinals. Seventeen-year-old wild card Caty McNally lost her third round match to No. 14 seed Viktorija Golubic of Switzerland 7-6(4), 6-1. Claire Liu, Kristie Ahn and Jessica Pegula also fell in today's third round. In the men's ATP Challenger 125 in Indian Wells, both remaining Americans were defeated, with Donald Young losing to No. 5 seed Lloyd Harris of South Africa 6-4, 6-2 and lucky loser Martin Redlicki losing to Salvatore Caruso of Italy 7-6(8), 2-6, 7-6(1). Despite his loss today, Donald Young has earned one of the main draw wild cards into next week's BNP Paribas Open, according this article from the tournament website. Former University of Michigan star Jason Jung of Taiwan, the No. 14 seed, advanced to the quarterfinals with a 7-5, 6-3 win over No. 2 seed and ATP 77 Filip Krajinovic of Serbia. Former Clemson star Yannick Maden of Germany, the No. 8 seed, also moved into the quarterfinals, where he'll play top seed Kyle Edmund of Great Britain. "Clearly, just eight weeks in to the new Tour, we need to be patient and gather more data evidence before we can make objective conclusions on its overall impact. However, we did note from the evidence and feedback we have so far that expanding qualifying draws to 32 players would fit within the existing structure of the Tour, while delivering greater opportunities for players; and we did not hesitate to make that adjustment." Why this wouldn't have been the appropriate structure from the beginning is not addressed in Nesbitt's comments. The last of the Team Indoor Championships begins tomorrow in Nashville, with Sewanee, The University of The South, as the host of the Women's Division III tournament. Claremont-Mudd-Scripps is the top seed, with Emory, the No. 2 seed and two-time defending champions. The quarterfinal matchups are 1 v. 8, 2 v. 7, 3 v. 6 and 4 v. 5. Slam Tennis has the bracket and the links to live scoring and live streaming. The ITA preview is here. Wild card Caty McNally picked up her third WTA Top 100 win this month in the second round of the Oracle Indian Wells Challenger, a WTA 125 event. The 17-year-old from Cincinnati won the $100,000 Dow Tennis Classic at the beginning of the month with a run that included wins over WTA 80 Madison Brengle and WTA 57 Rebecca Peterson, and today she beat No. 3 seed Vera Lapko of Belarus, currently ranked No. 63, 6-2, 6-4. All three of McNally's WTA Top 100 wins have been secured in straight sets. McNally lost her first round match last week at the $25,000 Rancho Santa Fe tournament to finalist Kristie Ahn, but rebounded with a first round win in Indian Wells over Sesil Karantacheva of Bulgaria to set up today's contest. McNally, who is getting very close to a ranking that would allow her to compete in the French Open women's qualifying, will face No. 14 seed Victorija Golubic of Switzerland next. Golubic defeated Jamie Loeb 6-3, 6-2 today. 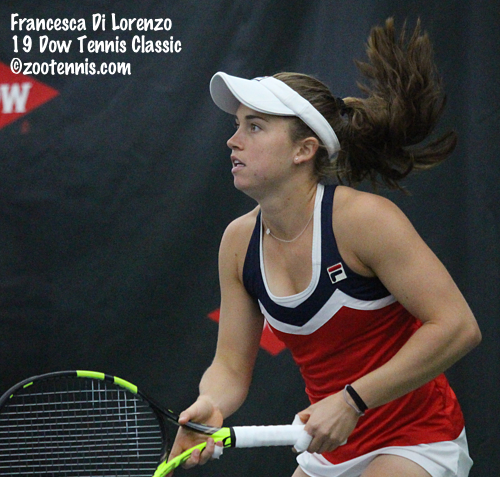 Former Ohio State Buckeye Francesca Di Lorenzo, who I spoke with recently at the Dow Tennis Classic for this Tennis Recruiting Network article, defeated No. 15 seed Lin Zhu of China 1-6, 6-3, 6-4. Claire Liu beat No. 13 seed Mandy Minella of Luxembourg 6-2, 3-6, 6-1 and will play top seed and WTA No. 18 Qiang Wang of China on Thursday. Kristie Ahn(Stanford) beat No. 16 seed Sorana Cirstea of Romania 7-6(4), 3-6, 6-3 and Nicole Gibbs(Stanford), coming off her title at Rancho Santa Fe, beat No. 5 seed Evgeniya Rodina of Russia 7-5, 6-3. The other two American winners were seeded players, with No. 10 seed Jessica Pegula beating Asia Muhammad 6-3, 6-0 and No. 2 seed Alison Riske outlasting Yanina Wickmayer of Belgium 3-6, 6-3, 6-3. Riske will face Brady next, with Townsend taking on Gibbs in the two all-US third round matches. For more on Riske's win over Wickmayer, see this article from the tournament website. The Oracle tournament website announced today that Pegula had already secured one of the two BNP Paribas Open wild cards that are stake this week, based on her previous results at the three other events in the series. The 125 ATP Challenger in Indian Wells has not been as kind to the American men, with only two advancing to the round of 16, lucky loser Martin Redlicki(UCLA) and unseeded Donald Young. The USTA/Tennis Channel rankings were released today, with very little change among the Top 10s and both the Georgia women and Ohio State men retaining their No. 1 positions. The complete lists of the Top 25 can be found in this USTA release. Jon Wertheim at Sports Illustrated (and the Tennis Channel) has been following the disruptions of the introduction of the ITF's World Tennis Tour for several months now, and in his weekly mailbag he provides some of the reasons why it has proven so unpopular. The data/live scoring/integrity problem has now reached the ITF Junior Circuit level, where live scoring is no longer allowed by the ITF, presumably because they are not making any money off what they feel is a corruption risk. I've asked the ITF for a statement on the reasons for their decision to ban live scoring at junior events, but I have yet to receive a response. In the US, this impacts the ITF Grade 1 International Spring Championships in Carson, and the ITF Grade A Orange Bowl in Plantation, who have had live scoring for many years. I assume it will have no impact on the junior slams, as that live scoring is integrated with the other slam events. Jonathan Kelley attended the ITA Men's Team Indoor Championships earlier this month and had an opportunity to talk with UCLA senior Maxime Cressy, who has taken the tennis world by storm the past six months, particularly in winning the Cleveland Challenger. Until quite recently, Cressy was playing for France, but he switched to representing the US, an option available to him with his mother an American. 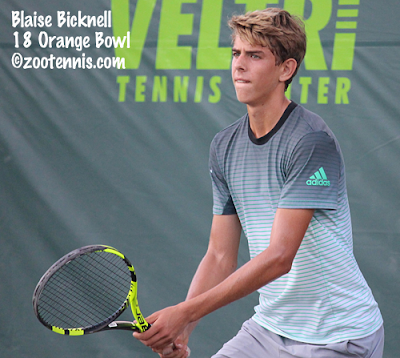 In this Tennis Recruiting Network article, Kelley asks Cressy about that decision, his lack of a notable junior career, how he managed to attract the attention of Division I college coaches and why he has adopted an aggressive, net-rushing style. Once you read the interview, you'll get an idea just how big a role confidence plays in a player's breakout. As I read it, I was struck by the irony of Cressy's selection of Pete Sampras as a role model, as their personalities could hardly be more different. Cressy's recent success is simply one more example of the folly of trying to establish a one-size-fits-all approach to development, with game styles and timetables best left to the desires of the player and his coach. The ITA Division I Team rankings this week demonstrate some of the quirks of the computer rankings, with the National Women's Team Indoor Champions Georgia falling from No. 1 to No. 2, despite beating Georgia Tech in their only match of the week. North Carolina, who lost a very close final to Georgia at the Team Indoor, moved into the No. 1 spot, with the Tar Heels getting wins over Boston College and Michigan. The USTA/Tennis Channel rankings don't come out until tomorrow, but I'm sure that Georgia will stay in the top spot with those human voters. Ohio State stayed at No. 1 in the men's rankings, and there was little change in the Top 10. Click on the headers for the full list of team rankings. There are no new individual rankings this week. The ITA has had a variety of sponsors since I've been following the sport, but I think it's safe to say that its current sponsor, Oracle, has provided financial support well beyond the contributions of companies in the past. Larry Ellison, the billionaire founder of Oracle, is well known in tennis circles now after his purchase of the BNP Paribas Open in Indian Wells, but Oracle CEO Mark Hurd does not have that same profile, at least outside of the college tennis community. Hurd, who played at Baylor and for whom the Baylor tennis center is named, is the engineer of Oracle's commitment to college tennis and, as this article by Steve Tignor at Tennis.com demonstrates, he isn't confining his interest to college tennis, with jump starting American tennis also part of his plan. 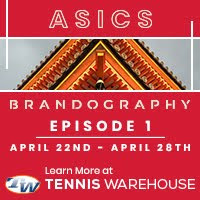 Tignor highlights the success of the first two recipients of the $100,000 Oracle Tennis Awards, Mackenzie McDonald and Danielle Collins, and the impact that the introduction of the new big money Challengers that Oracle has recently begun sponsoring. With the ITF's new World Tennis Tour off to a rocky start, it's not hard to see how the network of tennis connections Oracle is amassing could be used to become an even bigger player in a new direction for the sport. The Oracle Challenger series continues this week with the WTA 125 and ATP Challenger 125 tournaments at the Indian Wells Tennis Garden, the only pro events scheduled in the US this week. Sponsor Oracle has demonstrated a particular interest in promoting American tennis, and several teenagers from the US were given main draw wild cards, but unfortunately they were not able to post wins today against their more experienced competition. Seventeen-year-old wild card Zane Khan, who has not played since the Australian Open Junior Championships, got off to a good start against Yosuke Watanuke of Japan, but he couldn't close out the 20-year-old, who is 177 in the ATP rankings, losing 3-6, 6-2, 6-2. Seventeen-year-old wild card Katie Volynets was beaten 6-3, 6-3 by former UCLA star Jennifer Brady, who broke back into the WTA Top 100 this week after making the third round in Dubai. University of Virginia freshman Brandon Nakashima, another 17-year-old wild card, lost his opening round match to JC Aragone, a former Cavalier, who was playing Challengers in Thailand the past two week. Aragone, ranked 248, defeated Nakashima 6-1, 6-4. Sixteen-year-old Whitney Osuigwe, who made the field on her own WTA ranking, now 215, lost to Kristie Ahn 3-6, 7-6(5), 7-5. Ahn, who played in the final yesterday at the $25,000 World Tennis Tour event in Rancho Santa Fe, didn't get a late start, but she managed to fight through any fatigue in two-and-a-half hour match. Service holds were at a premium, with 16 breaks in the 33 service games, with Osuigwe letting a 4-0 lead slip away in the second set and Ahn unable to hold her 4-1, two-break lead in the third set. Wild card Coco Gauff couldn't close out former WTA Top 10 player Timea Bacsinszky of Switzerland despite a 4-0 lead in the third set, with the 14-year-old losing the last six games of the match in the 6-3, 1-6, 6-4 decision. The only teen to post a victory today was 18-year-old Olga Danilovic of Serbia, who beat Caroline Dolehide 4-6, 6-3, 6-1. Caty McNally, another 17-year-old wild card, was in the third set of her match when it was interrupted. Two US women advanced to the main draw via the four-player qualifying, with wild card Ena Shibahara(UCLA) defeating top seed Mayo Hibi 2-6, 6-3, 6-4 and wild card Kayla Day beating No. 2 seed Jovana Jaksic of Serbia 6-7(2), 6-4, 6-1. The two US men advancing to the main draw from qualifying are Ulises Blanch, who beat Martin Redlicki(UCLA) 6-2, 5-7, 6-4 and Michael Redlicki(Arkansas), who beat Alex Sarkissian(Pepperdine) 6-3, 6-3. US men advancing to the second round are Donald Young, Chris Eubanks, Christian Harrison and Mitchell Krueger. For more on the first round matches today, see the tournament website. The top two American finishers in the Oracle Challenge series, which concludes at this event, will receive wild cards into the BNP Paribas Open next month. The current points totals for the men and women can be viewed here. I missed the release of the ITA Division II rankings last week but the Top 10 are below, with the Barry men and Barry women both in the No. 1 positions this month. These rankings come out less frequently than the Division I rankings, and there were no individual rankings in January or February, with the first of those since November scheduled for next month. Beginning March 20th the D-II team and individual rankings will come out every week. Click on the header to go to the full rankings list. Defending Men's Division III Indoor champion and No. 2 seed Emory had a look at a four-peat, but top seed Chicago recovered to take its first National Indoor title by a 5-3 score. Chicago had a 2-1 lead after doubles, although they were a point from sweeping until Emory came through in a tiebreaker at line 3. But the defending champions came out strong in singles, winning four first sets at the 1, 2, 3, 4 positions, and if they had been able to hold those leads, they could claim their fourth straight title. But Jeremy Yuan of Chicago forced a third set at line 2 and claimed that point, while it was freshman Alex Guzhva at line 5 who delivered the fifth point, taking out Andrew Esses at line 5 6-4, 2-6, 6-3. Chicago, ranked No. 3, and Emory, ranked No. 4, (No. 1 Middlebury and No. 2 Bowdoin did not play the Team Indoor, as is customary for members of the New England Small College Athletic Conference) met twice last year, with Emory beating Chicago 5-4 in the semifinals of the Team Indoor, while Chicago took the UAA conference final match later in the year 7-2. The rivalry is a strong one, and I look forward to seeing both teams this year in May, at the Division III NCAA championships here in Kalamazoo. For more on Chicago's victory, see this article from their website and this article from the Tennis Recruiting Network. I spoke to head coach Jay Tee in the fall of 2017 about the Division III college tennis experience in this article for the Tennis Recruiting Network. The singles champions were crowned today at the ITF Grade A in Porto Alegre Brazil, with qualifier Ane Mintegi Del Olmo of Spain putting an exclamation point on her week by beating No. 4 seed Natsumi Kawaguchi of Japan 6-2, 4-6, 6-2. The 15-year-old, playing in her first Grade A tournament, defeated four seeds this week and avenged her loss to Kawaguchi in the quarterfinals of last week's Grade 1 Banana Bowl. Kalamazoo 16s champion Martin Damm fell in his first Grade A final, going out to unseeded Thiago Tirante of Argentina 5-7, 6-2, 6-2. The 17-year-old Tirante came from a set down in three of his six victories this week to claim his first Grade 1 or Grade A title. The only title for Americans on the ITF Junior Circuit this week went to brothers Alexander and John Bernard, who took the doubles at the Grade 4 in Guatemala. The No. 2 seeds beat top seeds Alfredo Casso and Mexico's Alfonso De Alba Valdes 6-4, 6-0 in the final. Alex, the No. 2 seed in singles, beat his unseeded older brother in the quarterfinals but lost in the semifinals to eventual champion Juan Sebastian Zabala Vargas of Ecuador, the No. 7 seed. 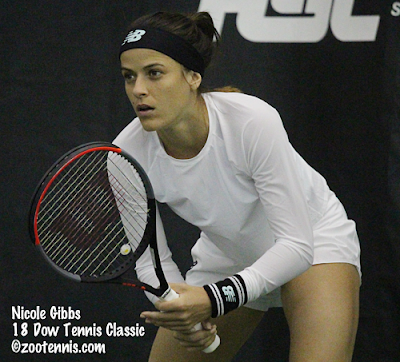 Nicole Gibbs continued her string of wins over former Stanford teammate Kristie Ahn today in the final of the $25,000 ITF World Tennis Tour tournament in Rancho Santa Fe California. Gibbs, the No. 2 seed, beat Ahn, seeded No. 5, 6-3, 6-3 to claim her sixth ITF Pro Circuit title. Gibbs is now 6-0 against Ahn in ITF events, although this is her first win since 2015 in a rivalry that dates back to and ITF junior event in 2008. Hayley Carter(North Carolina) and Ena Shibahara(UCLA) claimed their fifth title as a team, and one of their smaller ones. The No. 2 seeds, who won the WTA 125 Newport Beach title in January, beat unseeded Caty McNally and Francesca Di Lorenzo 7-5, 6-2 in the final. Carter and Shibahara, who didn't lose a set all week, have also won two $60,000 tournament titles and one other at the $25K level. 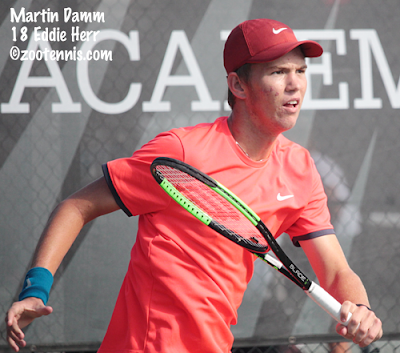 Martin Damm ended last year with a ITF Junior ranking of 312. But the 15-year-old has posted impressive results the past two months, going 15-3 at the major Central and South America tournaments, including a Grade 1 final in Costa Rica and a semifinal in Colombia, both on hard courts. The circuit then moved to South American clay, and after an second round exit last week at the Grade 1 Banana Bowl, where he was forced to qualifying, Damm has had his best ITF Junior Circuit results this week at the Grade A in Porto Alegre Brazil. Unseeded, the powerful left-hander has yet to lose a set, with wins over No. 12 seed Harold Mayot of France, No. 5 seed Holger Rune of Denmark, No. 2 seed Keisuke Saitoh of Japan, and in today's semifinal, No. 16 seed Carlos Alcaraz Garfia of Spain, with that decision coming by a 6-4, 6-4 score. Damm's string of wins over seeds will end regardless of the outcome of Sunday's final, with his opponent, 17-year-old Thiago Tirante of Argentina, also unseeded. Tirante thwarted an all-American, all-IMG final when he defeated No. 13 seed Toby Kodat 3-6, 6-2, 6-2. Damm and Kodat, the No. 8 seeds, fell in the doubles final to top seeds Saitoh and Shunsuke Mitsui of Japan 6-4, 6-1. Girls top seed Diane Parry of France saw her win streak this month end at nine, when this week's breakout star, 15-year-old qualifier Ane Mintegi Del Olmo of Spain, came back to record a 0-6, 7-5, 6-1 victory. Mintegi Del Olmo will face No. 4 seed Natsumi Kawaguchi of Japan, who beat No. 2 seed Alexa Noel 6-1, 7-5. Kawaguchi has already claimed one title in Brazil, partnering with Shavit Kimchi of Israel for the girls doubles crown. The No. 2 seeds beat the unseeded team of Sake Imamura of Japan and BoYoung Jeong of Korea 6-1, 4-6, 11-9 in the final. The final is set at the ITA Men's Division III Team Indoor Championships with three-time defending champion Emory, the No. 2 seed, facing top seed University of Chicago Sunday in Cleveland. Emory rolled past No. 6 seed Pomona-Pitzer 9-0 in today's semifinals, while Chicago had a battle on its hands with No. 4 seed Washington University-St. Louis. Chicago eventually posted a 5-4 victory, although Washington's fourth point came after Chicago had clinched the win. See Slam Tennis for links to the live streaming and live scoring for Sunday's final, scheduled to begin at noon Eastern time. Sunday's final at the $25,000 Women's ITF World Tennis Tour tournament in Rancho Santa Fe California will be an all-Stanford affair, with No. 2 seed Nicole Gibbs taking on former teammate Kristie Ahn, the No. 5 seed, for the title. Gibbs came back to defeat unseeded Ann Li 3-6, 6-3, 6-4, while Ahn had an easier time with likely fatigued qualifier Usue Arconada 6-1, 6-1. Gibbs has won all five of their previous ITF meetings, dating back to the juniors in 2008, but they have not played in the pros since 2015. Speaking of Stanford, a Top 10 non-conference women's Division I match today was played in Palo Alto today, and it was a rematch of the 2018 NCAA team final, although not nearly as dramatic. Rather than coming down to the last match, which the Cardinal won, No. 4 Stanford soundly beat No. 7 Vanderbilt 6-1 today. Stanford won the doubles point, then got wins from Melissa Lord at line 2, Emma Higuchi at line 6, and the clinching point from Emily Arbuthnott at line 4. The matches were played out, with Vanderbilt's only point coming at line 1, where Fernanda Contreras beat Michaela Gordon 7-6(6), 0-6, 14-12. For more on the match and the full box score, see the Stanford website. Sixteen-year-old Toby Kodat and 15-year-old Martin Damm have advanced to the semifinals of the ITF Grade A in Porto Alegra Brazil, the first time that either player has gone that deep at that level. A day after ousting the top seed, No. 13 seed Kodat defeated No. 11 seed Taha Baadi of Canada 6-1, 7-6(4). Damm, who is unseeded, cruised past No. 2 seed Keisuke Saitoh of Japan 6-4, 6-1. Damm has yet to drop a set this week, while Kodat has lost only one. Kodat will play unseeded Thiago Tirante of Argentina in the top half semifinal, while Damm faces No. 16 seed Carlos Alcaraz Garfia of Spain. Alcaraz defeated No. 6 seed Tyler Zink 6-2, 6-2. Damm and Kodat, both of whom train at IMG, are the No. 8 seeds in doubles and have advanced to the semifinals. No. 2 seed Alexa Noel defeated unseeded Charlotte Owensby in an all-US quarterfinal 6-3, 6-2, the third consecutive match that Noel has won by that score. The 16-year-old will face No. 4 seed Natsumi Kawaguchi of Japan in the semifinals, while top seed Diane Parry of France will take on the breakout star of this week's tournament, 15-year-old qualifier Ane Mintegi Del Olmo of Spain. Mintegi Del Olmo beat No. 3 seed Hurricane Tyra Black in the first round and in today's quarterfinals took out No. 5 seed Ana Geller of Argentina. The ITA Men's Division III National Team Indoor Championships are underway this weekend at host Case Western in Cleveland. Unlike the Division I Team Indoor Championships, the Division III version is an eight-team field. Three of the top four seeds have advanced to Saturday's semifinals, including No. 2 seed Emory, which has won the last three Indoor titles. Slam Tennis has the bracket and the links to live video and scoring. While I link to all my articles at the Tennis Recruiting Network, I don't do that for all their content, presuming that most of you visit that site regularly without any prompting from me. But today's article is especially deserving of attention, as members of the Wingate men's tennis team undertake a campaign to promote Set The Expectation, a program to raise awareness and educate other about sexual and physical violence. Rhiannon Potkey has the details on how Saturday's event, which has as its centerpiece the Wingate and Mars Hills men's and women's matches, developed. Eighteen-year-old Felix Auger-Aliassime of Canada, the 2016 US Open boys champion, has reached his first ATP semifinal this week at the ATP 500 event in Rio de Janeiro. Auger-Aliassime, a wild card, defeated No. 2 seed Fabio Fognini of Italy in the first round, and Juame Munar of Spain this evening. With no seeds remaining in the draw, Auger has a good opportunity for his first ATP title, but regardless of what happens the rest of the week, he will move into the ATP Top 100 for the first time, with his live ranking currently at 77. An American champion will be crowned Sunday at the $25,000 ITF World Tennis Tour in Rancho Santa Fe California, with US women advancing to Saturday's semifinals after a long day today. Due to rain the past two days, both the round of 16 and the quarterfinals were played today, with the round of 16 reduced to a match tiebreaker in lieu of a third set. No. 3 seed Kristie Ahn(Stanford) defeated wild card Katie Volynets 6-0, 2-6, 10-7, then rolled past unseeded Nadia Podoroska of Argentina 6-3, 6-0 in the quarterfinals. Ahn will face unseeded qualifier Usue Arconada, who beat top seed Sachia Vickery 6-4, 7-5. Arconada served for the match at 5-2 and 5-4 in the second set, didn't get to match point either time, but broke Vickery at love at 5-all and finally converted on her third opportunity to finish it. Ahn's former Stanford teammate Nicole Gibbs, the No. 2 seed this week, also needed a match tiebreaker in the second round, beating Jovana Jaksic of Serbia 3-6, 6-3, 10-5. Gibbs advanced to the semifinals with a 6-2, 6-4 win over Ana Sofia Sanchez of Mexico. Gibbs will face unseeded Ann Li, who beat No. 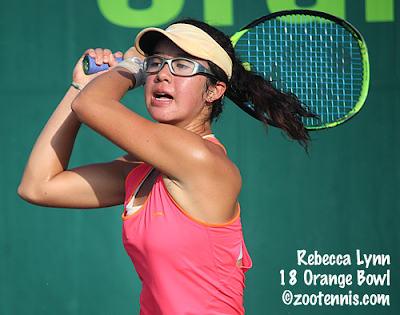 3 seed Claire Liu 6-4, 7-6(1) in a quarterfinal battle between 18-year-olds. With that win, Li avenged her loss to Liu in the 2017 Wimbledon girls final. Three US boys and two US girls have advanced to the quarterfinals of the ITF Grade A in Porto Alegre Brazil. 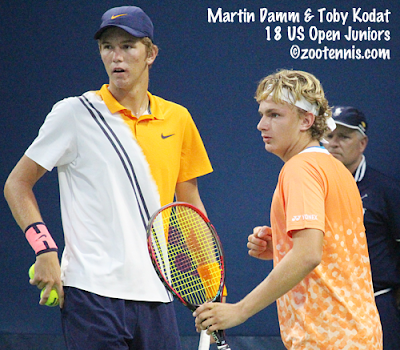 Sixteen-year-old Toby Kodat, seeded No. 13, ended the seven-match win streak of Nicolas Alvarez Varona of Spain, beating the top seed 6-4, 6-4 in today's third round. Alvarez had won the Grade 1 Banana Bowl last week. Kodat also had a win earlier this year over Alvarez in the first round of the Grade 1 in Traralgon Australia. Kodat faces No. 11 seed Taha Baadi of Canada in the quarterfinals. Kalamazoo 16s champion Martin Damm has also advanced to the quarterfinals, where he'll play No. 2 seed Keisuke Saitoh of Japan. Damm defeated fellow 15-year-old Holger Rune of Denmark, the No. 5 seed, 6-3, 6-4 in today's third round. No. 6 seed Tyler Zink is also through to the quarterfinals after beating Pedro Boscardin Dias of Brazil 7-6(5), 7-5. It's the first Grade A quarterfinal for Kodat and Damm, while Zink reached his other GA quarterfinal at the 2017 Orange Bowl. No. 2 seed Alexa Noel defeated unseeded Gabriela Macias 6-3, 6-2 in today's third round, while unseeded Charlotte Owensby beat No. 8 seed Mylene Halemai of France 2-6, 6-1, 6-4. The 15-year-old Owensby is making her debut in a Grade A quarterfinal, while Noel, 16, won the Grade A in Mexico in 2017. Unfortunately, Noel and Owensby now face each other for a place in the semifinals. The ITA announced the Division I Men's Team Indoor All-Tournament Team today, with champion Ohio State's JJ Wolf named the Most Outstanding Player. I received word earlier this week of the death of Bob Wood, who volunteered for the USTA Kalamazoo Nationals for 38 years. I met Bob when I began volunteering for the tournament in 2000, and we spent many an hour in the Stowe Stadium tower talking junior tennis, pro tennis, and most importantly to Bob, high school tennis. Wood was a legendary high school coach at University Liggett in Gross Pointe Michigan, winning 39 state championships: 27 boys and 12s girls titles. Well into his 70s, he was still involved in camps and clinics on the east side of the state, and he would return to Kalamazoo every year to answer phones, promote the tournament on radio and provide commentary on the public access station during the final weekend. After he retired, he moved to Tennessee and then Texas, and during those years he continued to coach and to follow high school tennis. His favorite question for any player who was called to the Tower was 'did you play high school tennis?' and he could not contain his delight if the answer was yes. With a lifetime in the sport, Wood had many stories, including those involving his two years coaching Aaron Krickstein, who, unsurprisingly, went undefeated in his two years of high school tennis. Krickstein turned pro after his sophomore year at Liggett, winning the Kalamazoo 18s title in 1983 after turning 16 a few days earlier, so Wood had a good idea of the kind of game that could translate to success on the pro tour. But Wood's greatest legacy will be the thousands of less talented young players he coached throughout his career. He demonstrated his commitment to transmitting a lifelong love of the sport with every camp and after-school session, embodying the role of coach and teacher. For the complete obituary, prepared by his family, click here. The first team rankings done by computer were released today by the ITA, with National Men's Team Indoor champions Ohio State taking over the top spot from Wake Forest. Georgia, the Women's Team Indoor Champions, remained at the No. 1 spot. The big movers in the Top 10 of the men's rankings were Virginia and Illinois, while Mississippi State fell from No. 3 to No. 9 after the Bulldogs went 1-2 at the Team Indoor and USC fell from No. 5 to No. 24. The USTA/Tennis Channel rankings, conducted by poll, are somewhat different, with TCU making a jump into the Top 10, and UCLA remaining there, unlike the ITA ranking, which has the Bruins at 14 now after being No. 7 last week. For the complete USTA Top 25, see this article. The women's rankings are not drastically different from last week, but Kansas has moved into the Top 10 and South Carolina moved to No. 6. The USTA poll varies in its assessment of the top Big Ten teams, with Michigan No. 10 versus No. 24 in the ITA rankings, and Northwestern No. 21 vs versus No. 10 in the ITA rankings. The singles rankings have new No. 1s, with Katarina Jokic of Georgia back in the top spot and JJ Wolf of Ohio State moving to No. 1 for the first time in his collegiate career. Paul Jubb of South Carolina went from 16 to No. 4, and Aleksandar Kovacevic of Illinois moved into the Top 10 after being 24 two weeks ago. Although Wolf will likely be the choice for No. 1 singles on the all-tournament team, and rightly so, Kovacevic went 3-0 at the top spot and is undefeated this year in dual matches. Maxime Cressy, the UCLA No. 1 and Cleveland Challenger champion, has still not broken into the ITA singles rankings. He is No. 30, with Keegan Smith, in the doubles rankings. Jokic, who went 4-0 at line 1 at the Team Indoor for the Bulldogs, also won the ITA Fall Nationals, so she is going to be hard to dislodge from the top spot going forward. 2018 NCAA singles finalist Ashley Lahey of Pepperdine is currently ranked 74 in singles. Click on the headers to go to the complete ranking lists. The Oracle Challenger Series moves to Indian Wells next week, with the WTA 125 event and the ATP Challenger played at site of the BNP Paribas Open. Wild cards for the tournaments have been announced, with Caty McNally and Coco Gauff receiving them for the main draw, along with Lauren Davis, Wang Qiang of China and former Ohio State star Francesca Di Lorenzo, who received the Oracle College Award last year. Men receiving wild cards include Kyle Edmund of Great Britain, Christian Harrison, UCLA senior Maxime Cressy, Virginia freshman Brandon Nakashima and Kalamazoo 18s champion Jenson Brooksby. Qualifying wild cards were awarded to Kayla Day, Ena Shibahara(UCLA), 17-year-old Zane Khan, and Michael Redlicki (Duke/Arkansas). The first round of the ITF Grade A in Porto Alegre Brazil is complete, with ten US girls and five US boys advancing. Last week's Grade 1 Banana Bowl winners and top seeds this week have advanced to the second round, with Diane Parry of France and Nicolas Alvarez Varona of Spain picking up straight-sets victories today. But Banana Bowl finalist Hurricane Tyra Black, the No. 3 seed, was beaten by Spanish qualifier Ane Mintegi Del Olmo 7-6(3), 6-0. This follows yesterday's 6-2, 6-0 loss by No. 4 seed Eliot Spizzirri, a semifinalist last week, to Thiago Tirante of Argentina. Alexa Noel, who hasn't played the last three Grade 1s in South America, is back in action this week and is the No. 2 seed. She advanced to the second round with a 6-3, 7-5 win over Tina Smith of Australia. Fifteen-year-old Ellie Coleman eliminated No. 6 seed Gabriela Martinez Asensi of Spain 6-1, 4-6, 6-3 yesterday and 14-year-old qualifier Rebecca Lynn took out No. 15 seed Ana Luiza Cruz of Brazil 6-4, 6-3 today. Zora Hudson, a 17-year-old American with no ITF junior ranking, got into qualifying, but lost in the final round. She got into the main draw as a lucky loser, replacing Gabby Price, and won her first ITF Junior Circuit match today. She defeated wild card Maria Fernanda Menezes of Brazil 3-6, 6-2, 6-4. Winning your first ITF junior main draw match in a Grade A is rare; even wild cards usually have had some points from lower level ITF tournaments and it is difficult to get into qualifying at that level without any points. Hina Inoue, Kailey Evans, Hibah Shaikh, No. 7 seed Charlotte Chavatipon, Sasha Yepifanova and Charlotte Owensby are the other US girls reaching the second round. US boys posting wins in the first round are Toby Kodat, Blaise Bicknell, Andrew Dale, Tyler Zink, Dali Blanch and Martin Damm. The only ITF World Tennis Tour event this week in the United States is a $25,000 tournament in Rancho Santa Fe California. Qualifying concluded today, with Usue Arconada, Quinn Gleason(Notre Dame) and Caroline Dolehide the Americans reaching the main draw. Dolehide took a wild card into qualifying; she would have been one of the top seeds in the main draw with her WTA ranking of 131 had she entered initially, but she is not seeded in the main draw now. Wild cards Kayla Day and Katie Volynets recorded first round main draw wins today, with Day beating wild card Lorraine Guillermo(Pepperdine) 6-1, 6-3 and Volynets defeating Sandra Samir of Egypt 6-2, 2-6, 6-3. 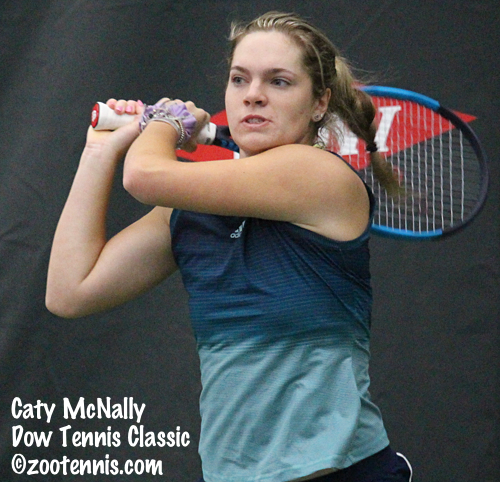 Caty McNally, in her first match since winning the $100,000 Dow Tennis Classic, lost to No. 5 seed Kristie Ahn (Stanford) 3-6, 6-2, 6-3. Sachia Vickery and Nicole Gibbs are the top two seeds, seeing their first action on Wednesday. The University of Florida women recently had the most dominating home court advantage in college tennis winning 163 straight matches until a loss to Georgia in March of 2017 ended that streak and several others. They did go on to win the NCAA title that year, so it was hardly the end of the world, but the prospect of making the NCAA quarterfinals at nearby Lake Nona are less promising this year. Already this year, the 24th-ranked Gators have lost three matches at home, to Cal, to NC State in the Kick-off weekend, and tonight in a 4-1 loss to arch-rival Florida State. Ranked No. 20, Florida State had its own disappointment at home this year when they lost in the first round of the Kick-off weekend to Tennessee, but they recently defeated Miami in Tallahassee and now have a win over Florida. Wins over those two programs are satisfying for any team, but only more so, I'm sure for the Seminoles, who play Duke Friday in Tallahassee. The doubles point Ohio State won in a tiebreaker didn't look particularly significant when the Buckeyes won four first sets in singles against defending champion and No. 3 seed Wake Forest at the ITA Division I Men's Team Indoor Championships today in Chicago. But when Martin Joyce closed out top-seeded Ohio State's 4-2 victory with a 7-5, 7-5 win over Wake's Melios Efstathiou at line 4, a huge sigh of relief was almost audible at the Midtown Athletic Club, with the doubles point having given the Buckeyes a bit of breathing room that they ended up appreciating. For the second match in a row, Ohio State won the doubles point when the other team was serving for it, and both times it was John McNally and Hunter Tubert at line 3 that mounted the comebacks. Against Wake Forest's Siddhant Banthia and Julian Zlobinsky, McNally and Tubert saved two match points on deciding points serving at 3-5 and receiving at 5-4, and in the tiebreaker that decided the doubles point, came from 3-2 down to win the final five points of the match. Ohio State, who had not lost a point in their previous three wins this weekend, began the singles confidently, taking four first sets in singles. 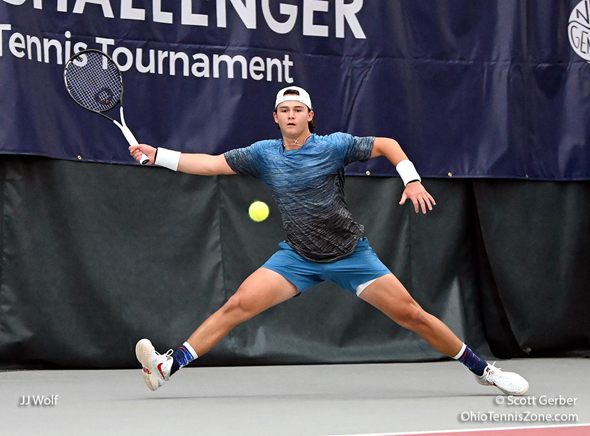 JJ Wolf, who won the Columbus Challenger last month, has continued to play pro-level tennis in dual match season, and he quickly closed out Wake Forest's Borna Gojo 6-0, 6-3 to extend the lead to 2-0. At that stage, Ohio State looked to be in great shape to grab its second National Team Indoor title, with McNally up a set and a break over Petros Chrysochos at line 2, Alex Kobelt up a set a and a break over Yuval Solomon at line 5 and Joyce securing his first set. Kobelt quickly closed out his win for the Buckeyes third point, and again Wake looked down and out, but the Demon Deacons had been in jeopardy throughout the weekend, so they were plenty comfortable playing from behind. When Tubert earned a split against Banthia at line 6, both McNally and Joyce were both just two games from another shutout for the Buckeyes, but Wake Forest was not about to concede. Bar Botzer closed out his 6-2, 6-3 win over Kyle Seelig at line 3 to make it 3-1, just as McNally lost his break in the second set. Tubert was up 3-1 in the third at line 6, but Joyce lost his break, and when Banthia won his fifth straight game to make it 3-2, a miracle comeback seemed possible for Wake. Just as Chrysochos won a tiebreaker to send his match with McNally to a third set, Joyce got a break at 5-all and had an opportunity to serve for the match. The senior from Illinois continued to play his aggressive indoor game despite falling behind 15-30 and he calmly closed out the title, leaving the most exuberant celebrations to his teammates. Four of the six Buckeyes playing singles today had played in the NCAA final last year against Wake Forest, with the Demon Deacons winning that by the same score that Ohio State posted today. Three of the six Americans in the Ohio State lineup are from Ohio and five are from the Midwest section, a rare team composition with the current trend toward international players in Division I tennis. 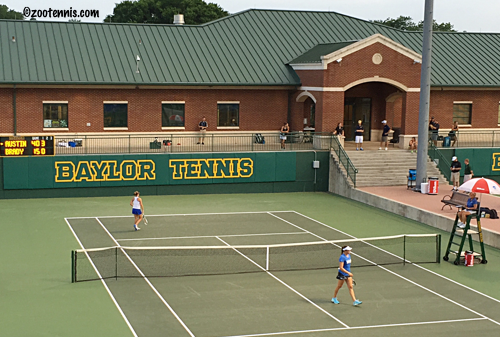 For more on today's final, see the Tennis Recruiting Network's recap, College Tennis Today's recap, and the Ohio State website recap. At the ITF Grade 4 in Mexico, 17-year-old Georgia Tech recruit Andres Martin took the singles title, his first on the ITF Junior Circuit. The top seed defeated No. 16 seed Marcus McDaniel 6-3, 7-6(4) in the all-US final, claiming all six of his victories in straight sets. McDaniel and his partner Max McKennon, the No. 2 seeds, won the doubles title, beating Martin and his partner Jeffrey Fradkin, the top seeds, 6-3, 7-6(3) in the final. Defending champion Wake Forest and top seed Ohio State have advanced to Monday's final at the ITA Division I Men's Team Indoor Championships, with the routes the two teams have taken to get there markedly different. Wake Forest, who was the top-ranked team in the country in the last published rankings, has had to eke out wins in all three rounds prior to this one. Columbia had them on the ropes in the round of 16 Friday, they needed to come back from 4-1 down in the third of the last match on in Saturday's quarterfinal with UCLA and today the Demon Deacons were undeniably tested by ACC rival North Carolina before posting a 4-2 victory. In contrast, the Buckeyes have yet to drop a point, blanking Tulane, Virginia and in today's semifinals, Texas. Ohio State was looking at the loss of the doubles point today against the Longhorns, with Yuya Ito and Chi Chih Huang serving for the point at 6-5 against Kyle Seelig Hunter Tubert and John McNally at line 3, after the teams had split at lines 1 and 2. But Tubert and McNally broke and dominated the tiebreaker, with that momentum carrying over to the singles. Ohio State won five first sets in singles and JJ Wolf at line 1, Tubert at line 6 and McNally at line 3 closed out their opponents in straight sets to get the shutout. Texas's Colin Markes had match points at line 5, but he was not able to cash one in before McNally recorded his victory. Wake Forest won the doubles point over North Carolina, an important start given that the two teams split the first sets in singles. The Tar Heels got a quick first point to tie it up, with Brian Cernoch beating Wake's Saturday hero Melios Efstathiou 6-2, 6-4, and with William Blumberg taking the second set over Borna Gojo at line 1, North Carolina looked to be in good position, especially when Simon Soendergaard earned a split at line 5. Bo Boyden won at line 6 for North Carolina to make it 2-1, but Wake got an important split at line 3, with Bar Botzer taking the deciding point with Josh Peck serving at 5-6 in the second. Blumberg had gone up 3-0 in the third set, but Gojo got the break back, only to lose it again and go down 4-2. Again, Blumberg was unable to hold serve and this time Gojo did pull even, but Blumberg earned two match points with Gojo serving at 4-5. Gojo saved one with a forehand winner and on the deciding point, Blumberg sliced a backhand long to make it 5-5. Blumberg was broken in the next game, and although he saved one match point at 40-30, Gojo won another key deciding point with a big first serve to make it 2-2. Wake took a 3-2 lead with Petros Chysochos's three-set win over Benjamin Sigouin at line 2, and by that time Wake's Botzer had taken complete control of his match against Peck at line 3. Botzer closed it out 6-1 in the third to send Wake Forest back to the final for a rematch of the 2018 NCAA men's team championship match. Live scoring and the links to live streaming for Monday's final can be found at Slam Tennis. Martin Redlicki picked up his first singles title on the pro tour today at the $15,000 World Tennis Tour tournament in Tucson. The recent UCLA graduate had lost his three previous finals, including one to his opponent today Karue Sell of Brazil, also a former Bruin. Redlicki, the top seed, defeated No. 2 seed Sell 6-4, 6-4, hitting 10 aces and converting on four of his six break points. 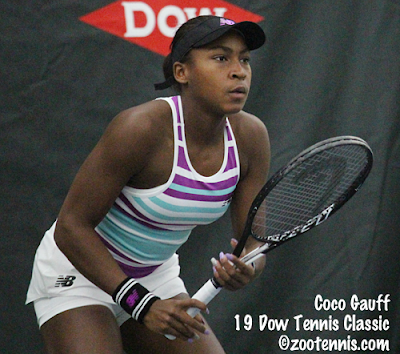 A bit farther north at the $25,000 women's WTT event in Surprise Arizona, unseeded 14-year-old Coco Gauff came up short in her first pro singles final, losing to No. 3 seed Sesil Karatancheva of Bulgaria 5-7, 6-3, 6-1. Gauff could not overcome 13 double faults and won only two of her eight service games in the last two sets. Gauff did win her first pro title however, capturing the doubles title this week with former Georgia Tech star Paige Hourigan of New Zealand. Gauff, the 2018 US Open girls doubles champion, and Hourigan defeated another unseeded team in the final, beating Usue Arconada and Emina Bektas 6-3, 4-6, 14-12. Reilly Opelka claimed his first ATP title today at the New York Open, but it certainly wasn't easy. The 21-year-old from Florida needed six match points and 43 aces to defeat former University of North Carolina star Brayden Schnur of Canada 6-1, 6-7(7), 7-6(7). Opelka had two match points at 6-4 in the second set tiebreaker, but Schnur held steady and used his willingness to come forward and volley to his advantage on key points. Schnur saved all three break points he faced in the third set, and down 6-4 in the third set tiebreaker, the 23-year-old saved two more match points, the second save by way of a double fault by Opelka, just his second of the match. Schnur saved another match point at 6-7, but at 7-all he just missed an ace, which Opelka challenged. It was out by the smallest of margins, but Schnur had to hit another serve and he double faulted, only his second double fault of the match. On match point No. 6, Opelka hit an ace to end the two-hour battle, the 156th ace he hit during the week. Opelka will move to 56 in the ATP rankings, a career high, while Schnur, who was an alternate for qualifying, will move to a career high of 107. For more on the final, see the ATP website. Opelka wasn't alone in earning his first ATP title in New York. 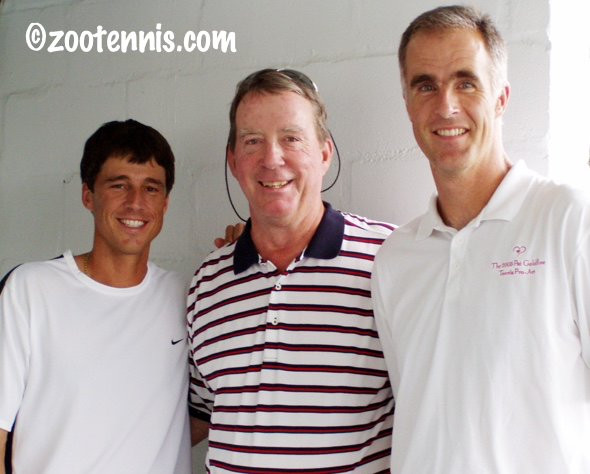 Former Auburn star Andreas Mies won the doubles title, with fellow German Kevin Krawietz. The unseeded pair, who have won five Challenger titles in the past year, didn't drop a set all week. They defeated unseeded Santiago Gonzalez of Mexico and Aisam-Ul-Haq Qureshi of Pakistan 6-4, 7-5 in the final. The quarterfinals of the ITA Men's Indoor Championships Saturday started as Friday's round of 16 ended, with two matches decided 4-3. No. 7 seed North Carolina defeated TCU, with junior Josh Peck defeating Reese Stalder of TCU 7-5, 6-7(7), 6-1 at line 3 to decide it. In the match that followed, No. 3 seed Wake Forest survived a scare from No. 6 seed UCLA, with Melios Efstathiou coming from 4-1 and two breaks down in the third to beat fellow freshman Matt Tsolakyan of UCLA 6-3, 3-6, 7-5 for the fourth point. The later two matches were decidedly less dramatic, with top seed Ohio State blanking No. 8 Virginia, and No. 5 seed Texas doing the same to No. 13 Southern Cal. Click on the links below to go to the winning team's recap. Fourteen-year-old Coco Gauff had not advanced past the second round of a pro tournament until this week at the $25,000 World Tennis Tour event in Surprise Arizona. But the current ITF World Junior No. 2 has won four matches this week, and today made her first pro final by defeating 30-year-old qualifier Olga Govortsova of Belarus 6-3, 0-6, 6-3. After losing six straight games to drop the second set, Gauff took a 4-0 lead in the third set, but Govortsova, a former WTA Top 40 player, got one of the breaks back and drew as close as 3-4. Gauff steadied herself however, held for 5-3, then broke Govortsova to claim the win. Gauff will face 29-year-old Sesil Karatantcheva of Bulgaria, the No. 3 seed, who defeated No. 2 seed Allie Kiick 6-1, 6-3 in the other semifinal. UCLA may not have had the result they wanted in today's Team Indoor quarterfinal, but the Bruins are coming up big at the $15,000 World Tennis Tour event in Tucson, with both Martin Redlicki and Karue Sell of Brazil advancing to Sunday's final. Redlicki, the top seed, defeated unseeded Jose Olivares of the Dominican Republic 7-6(4), 6-1, while Sell, the No. 2 seed, reached the final with a 6-4, 6-4 decision over wild card Isaiah Strode. Redlicki will be looking for his first pro singles title while playing in his fourth pro final; one of those losses came at the hands of Sell, who beat him 6-7(4), 6-4, 6-3 in the 2017 Claremont Futures final. Sell is a perfect 3 for 3 in Futures finals, with his most recent title last April. Both will leave Tucson with a title regardless of the outcome of the singles final, with the pair taking the doubles championship today. The No. 2 seeds defeated Ireland's Julian Bradley(North Florida) and Strong Kirchheimer(Northwestern), who were unseeded, 6-4, 6-1 in the final. The streak of Grade 1 titles for American girls ended at four today in Brazil, with Hurricane Tyra Black, the No. 2 seed, falling to top seed Diane Parry of France 6-4, 6-4 in the Banana Bowl final. The top seed in the boys draw also claimed the championship, with Nicolas Alvarez Varona of Spain defeating No. 12 seed Harold Mayot of France 6-4, 6-2 in the final. Former University of North Carolina star Brayden Schnur of Canada has reached the final of the ATP's New York Open after defeating No. 6 seed Sam Querrey 7-6(7), 4-6, 6-3. Schnur, 23, has won five Futures titles, but has not captured a Challenger title yet. If he should defeat Reilly Opelka on Sunday, Schnur will move into the ATP Top 100 for the first time. Even if he doesn't take the title, Schnur has already had an amazing week, getting through qualifying, winning his first ATP match (over wild card Jack Mingjie Lin of Columbia) and then getting his first ATP Top 50 wins over Steve Johnson and Querrey. He is also 5-1 in tiebreakers this week, which certainly helps in picking up wins. I interviewed Schnur after his freshman year at UNC, back in 2014, for this Tennis Recruiting Network article. Speaking of tiebreakers, Opelka has also earned his first trip to an ATP final in New York, beating top seed John Isner 6-7(8), 7-6(14), 7-6(4) tonight, his second consecutive all-tiebreaker win over Isner. Opelka, who beat Isner in four sets in the first round of the Australian Open last month, saved six match points in the second set tiebreaker. Isner and Opelka combined for 81 aces and just two double faults. I had an opportunity to sit down with Francesca Di Lorenzo late last month at the Dow Tennis Classic in Midland. I knew she was just coming back from an injury and I hadn't spoken to her about her first year as a professional since leaving Ohio State after her sophomore season in 2017. One of the toughest competitors I ever saw in junior tennis, Di Lorenzo has continued to improve and had made her way to 150 in the WTA rankings before her injury last fall. 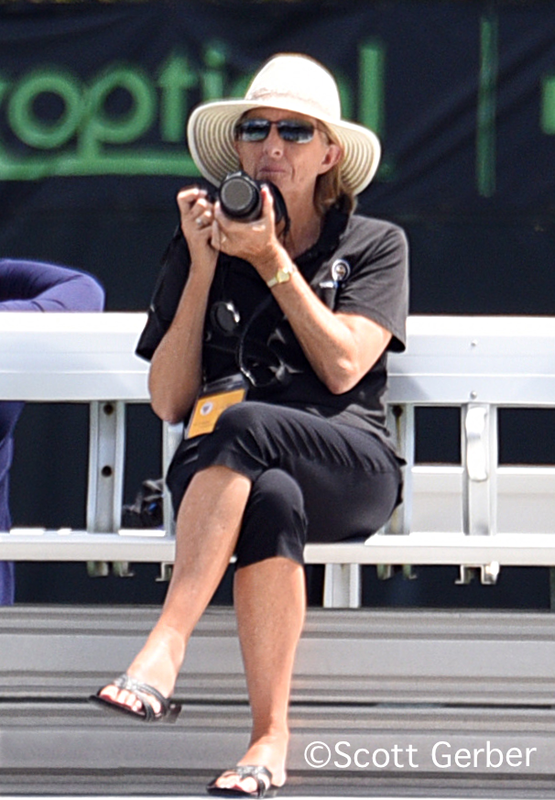 In this question and answer session, published today at the Tennis Recruiting Network, Di Lorenzo told me why college tennis was right for her, what she liked about it, a couple of the drawbacks and how she has changed her game since then. I encourage everyone who has pro tennis ambitions to read her candid comments about her transition from junior to college to pro tennis and what the support of her coaches and Oracle have meant to her success. The first day of the ITA Men's Team Indoor Championships in Chicago. which concluded a few minutes ago, with Friday's round of 16's best matches closing out the day. Both No. 4 Florida vs No. 13 USC and No. 5 Texas vs No. 12 Illinois were decided in the last match on in third set tiebreakers, with the Longhorns watching their 3-0 lead disappear and needing a 4-6, 7-5, 7-6(5) win from Leonardo Telles over Zeke Clark at line 3 to secure the 4-3 win. USC and Florida also went down to the wire, with five of the six singles matches going to a third set. USC took the doubles point and, eventually, earned wins at lines 1, 2 and 3, with Brandon Holt defeating Florida's Oliver Crawford 3-6, 7-5, 7-6(3) at line 1 to give the Trojans the victory. In an early match, TCU, seeded No. 15, defeated No. 2 seed Mississippi State 4-1, taking four singles matches after dropping the doubles point. Click on the link shown in the results below for a recap of the matches. Slam Tennis has the bracket and schedule for Saturday's quarterfinals. The $25,000 Women's World Tennis Tour event in Surprise Arizona got back on schedule today with two rounds played, the second round and the quarterfinals. The second round matches were shortened to a match tiebreaker in lieu of a third set, but only one match was decided in that format, with the other seven all straight sets. Fourteen-year-old Coco Gauff beat No. 4 seed Ashley Krazter 7-5, 6-1 in the second round, then took out No. 8 seed Ann Li 6-4, 7-5 to advance to her first professional-level semifinal. She will face 30-year-old qualifier Olga Govortsova of Belarus, who was ranked in the WTA Top 50 more than a decade ago. The other semifinal will feature No. 2 seed Allie Kiick against 29-year-old Sesil Karatancheva of Bulgaria, the No. 3 seed. In case you missed it, I spoke to Gauff last month in Midland about her transition from junior to pro tennis for the Tennis Recruiting Network. Hurricane Tyra Black, the No. 2 seed, has advanced to the final of the ITF Grade 1 Banana Bowl this week in Brazil. Black defeated No. 11 seed Charlotte Owensby 6-3, 6-3 and has lost only 11 games in her four victories. She will play top seed Diane Parry of France, who beat No. 3 seed Natsumi Kawaguchi of Japan 4-6, 6-1, 6-2. Kawaguchi did get a title this week, winning the doubles with partner Shavit Kimchi of Israel. The No. 2 seeds defeated unseeded Romino Ccuno of Peru and Metka Komac of Slovenia 6-0, 6-0 in the final. Top seeded Americans Tyler Zink and Eliot Spizzirri won the boys doubles title when Santiago De La Fuente and Juan Bautista Torres of Argentina, the No. 5 seeds, retired trailing 5-2 in the first set. Spizzirri, the No. 3 seed in singles, lost to top seed Nicolas Alvarez Varona of Spain 6-3, 7-5. Alvarez will face No. 12 seed Harold Mayot of France, who beat No. 16 seed Torres 6-4, 4-6, 7-6(5). Three Americans plus former North Carolina star Brayden Schnur of Canada have reached the semifinals of the ATP 250 New York Open this week. The 23-year-old Schnur, who qualified in New York after reaching the quarterfinals of the Dallas Challenger last week, beat Paolo Lorenzi of Italy 6-7(7), 7-6(5), 7-5 to reach his first ATP semifinal. He will play No. 6 seed Sam Querrey, who beat Jason Jung(Michigan) of Taiwan 6-3, 3-6, 6-3. The top half semifinal will be a big one, with No. 1 seed John Isner(Georgia) taking on Reilly Opelka. Isner defeated No. 7 seed Jordan Thompson of Australia 6-4, 6-1 while Opelka downed Guillermo Garcia-Lopez of Spain 6-3, 6-4. Opelka beat Isner in the first round of the Australian Open last month in four tiebreakers. Charlotte Owensby and Hurricane Tyra Black will meet in the semifinals of the ITF Grade 1 Banana Bowl Friday in Brazil, assuring an American girl will reach the final of five consecutive Grade 1s in Central/South America to start the year. Fifteen-year-old Owensby, the No. 11 seed, defeated unseeded Mell Reasco Gonzalez of Ecuador 6-2, 6-0 to reach her second Grade 1 final of the year, with the first of her career coming last month in Costa Rica. No. 2 seed Black, playing her first tournament this year, defeated unseeded Ellie Coleman 6-1, 6-2. No. 1 seed Diane Parry of France will face No. Natsumi Kawaguchi of Japan in the top half's semifinal. No. 3 seed Eliot Spizzirri is the only American boy to advance to the semifinals after four made the quarterfinals. Spizzirri eked out a 5-7. 6-4, 7-6(3) win over No. 10 seed Arthur Cazaux of France. Spizzirri will play top seed Nicolas Alvarez Varona of Spain, who beat unseeded Blaise Bicknell 7-5, 6-3. No. 6 seed Tyler Zink lost to No. 16 seed Juan Bautista Torres of Argentina 6-2, 6-2 and No. 15 seed Toby Kodat was beaten 6-0, 6-2 by Harold Mayot of France. Spizzirri and Zink, the top seeds, have advanced to the boys doubles final, where they will play No. 5 seeds Torres and Santiago De La Fuente of Argentina. Rain in Arizona kept any second round matches from being played at the $25,000 women's World Tennis Tour tournament in Surprise Arizona. Round of 16 and quarterfinal matches are scheduled for Friday. 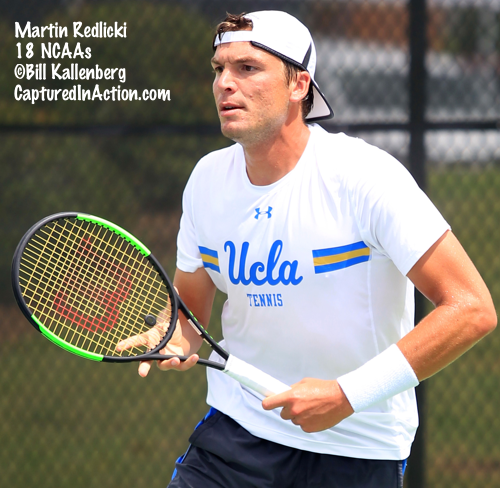 At the $15,000 WTT men's event in Tucson, four singles matches were completed, with the top two seeds, Martin Redlicki(UCLA) and Karue Sell(UCLA) of Brazil advancing to the quarterfinals. The remaining four matches, all in progress, were suspended until Friday, with the quarterfinals to be played Friday as well. As is usually the case, the All-Tournament Team at the Women's ITA Team Indoor Championships is skewed toward members of the two finalists. This year champion Georgia and runner-up North Carolina earned recognition in eight of the nine spots. Georgia sophomore Katarina Jokic, who clinched the 4-3 semifinal win over Stanford and the 4-3 final win over North Carolina, was named the Most Outstanding Player. The ITA Division I Men's Team Indoor begins Friday at the Midtown Athletic Club in Chicago. Below are the times (all times Central) for the eight matches on the schedule. For live streaming and live scoring links, see the Slam Tennis site. Four US boys and three US girls have advanced to the quarterfinals at this week's ITF Grade 1 Banana Bowl in Brazil. Unseeded Blaise Bicknell, No. 3 seed Eliot Spizzirri, No. 6 seed Tyler Zink and No. 15 seed Toby Kodat are the US boys posting wins today in Criciuma. Bicknell, a Florida recruit, defeated No. 5 seed Santiago De La Fuente of Argentina 6-3, 6-2 and will face top seed Nicolas Alvarez Varona of Spain in Thursday's quarterfinals. Kodat took out No. 4 seed Holger Rune of Denmark 1-6, 6-2, 6-1. If a US girl is going to win a fifth consecutive ITF Grade 1 title in Central/South America this year, the winner will come from the bottom half of the draw, where No. 2 seed Hurricane Tyra Black, No. 11 seed Charlotte Owensby and unseeded Ellie Coleman all advanced to the quarterfinals. Coleman defeated No. 5 seed Mylene Halemai of France 6-4, 7-5 and will face Black in the quarterfinals. Owensby will play unseeded Mell Reasco Gonzalez of Ecuador. Both the men and the women have new No. 1s in the USTA/Tennis Channel rankings this week, after the Georgia women claimed the ITA Team Indoor Title yesterday and previous men's No. 1 Wake Forest lost to Virginia last Friday. The USTA/Tennis Channel Top 10s are below, with the complete Top 25 lists available here. The ITA released women's rankings today, and I believe it is the last set of rankings that will be via poll, with computer rankings starting next week. Because the Men's Team Indoor is this weekend, there are no new men's team rankings, but from the seedings released in yesterday draw, it's obvious that Wake Forest has dropped from No. 1 in those rankings as well. Two ITF World Tennis Tour events are being held this week in the US, with the women at a $25,000 tournament in Surprise Arizona and the men just down the road for a $15,000 tournament in Tucson. The first round was completed today in Surprise, with top seed Maria Bouzkova of the Czech Republic advancing to the second round. Fourteen-year-old Coco Gauff used a junior exemption for entry this week and won her first round match yesterday; she will play No. 4 seed Ashley Kratzer in the Thursday's second round. Gauff defeated 2017 USTA National 18s champion Krazter 7-6(6), 6-7(6), 6-4 in the first round of the Dow Tennis Classic in Midland last month. Other US women advancing to the second round are Usue Arconada and Grace Min, Allie Kiick and Kayla Day, and Ann Li and Pamela Montez[WC], all of whom play each other in the second round. In Tucson, former UCLA star Martin Redlicki is the top seed, and he has advanced to a second round meeting with Jordi Arconada(Texas A&M). Other Americans winning their first round matches are Vasil Kirkov, Strong Kirchheimer(Northwestern), Isaiah Strode[WC], Gage Brymer[Q](UCLA), Jenson Brooksby(Baylor recruit) and Dusty Boyer(Nebraska). Carol Kimmelman Athletic and Academic Campus to be developed in Carson California, just a short distance from the StubHub Center, the current home of the USTA's Player Development West Headquarters and the ITF Grade 1 International Spring Championships. The new complex will feature academic and athletic facilities, including soccer, multipurpose fields and as many as 52 tennis courts. The USTA's Southern California section will move there, as will USTA Player Development. Groundbreaking could take place as early as next year. For the complete release, click here. For more on the Kimmelman campus, see its website. For the third day in a row No. 5 seed Georgia overcame the loss of the doubles point to eke out a 4-3 victory, with the stakes growing each day. Today in the final of the ITA Women's Team Indoor Championships in Seattle, the Bulldogs took out No. 2 seed and defending champion North Carolina, with sophomore Katarina Jokic once again providing the final point. The doubles point gave no indication of the drama that was to come, with the Tar Heels winning at lines 1 and 2 by scores of 6-1, 6-2, while Georgia won at line 3 6-1. In singles, Georgia pulled even quickly, with Elena Christofi beating Alle Sanford 6-2, 6-2 at line 5, but it was a long time before any other points were posted. With first sets in singles split evenly, Georgia needed to force a third set, and they got it when UNC's Alexa Graham was unable to close out Maria Lourdes Carle at line 3 despite leading 6-0, 5-3. Georgia also earned a third set at line 4, with Vivian Wolff coming back against Cameron Morra and at line 1, with Jokic taking her second set with Makenna Jones. Momentum began to swing toward Georgia when Meg Kowalski defeated Jessie Aney 6-2, 7-6(3) at line 6 for a 2-1 lead. Graham finally closed out Carle to pull the Tar Heels even, but Wolff claimed her match to make it 3-2 Georgia. North Carolina's Sara Daavettlla had forced a third set in her match with Marta Gonzalez at line 2, but as Jokic earned her split on 1, Daavettila was already down a break in the third at 3-1. She lost her serve again on a deciding point and when Gonzalez held for a 5-1 lead, the final set in the match at line 1 didn't appear to have any significance. But Gonzalez couldn't get to match point on her first attempt to serve it out at 5-2, or at 5-4. Her only match point came the deciding point with Daavettila serving at 3-5, which Daavettila saved by forcing an error from Gonzalez. Meanwhile, Jones had earned a 4-2 lead on 1, and a miracle comeback seemed possible for North Carolina, when Gonzalez again failed to serve out the championship up 6-5 in the third. Jokic had taken a medical timeout on court 1 after Jones went up 5-2 and when she returned to action, won four straight games. With some big hitting, Daavettila dominated the tiebreaker, tying the score and giving North Carolina new hope. But Jones was broken at love, dampening the Tar Heel spirits, only to have them raised again when Jokic lost her serve at love to send the national championship to a third-set tiebreaker. Jones fell behind early and Jokic stepped up her game, with much of the drama drained from the outcome when Jones made an unforced error on the forehand side to fall behind 5-1. Jokic, who had clinched the 4-3 semifinal win over No. 1 Stanford on Monday, came through again, closing out the title on her second match point. Having beaten No. 2 Vanderbilt, No. 1 Stanford and No. 3 North Carolina in succession, Georgia will now move to No. 1 in the rankings. The National Indoor title is the first for Georgia since 2002, and they avenged their loss to North Carolina in the 2015 final. For more on Georgia's title, see the Georgia athletic website. GEORGIA CAPTURES ITS SIXTH NATIONAL CHAMPIONSHIP IN PROGRAM HISTORY!!!! Links to live scoring and streaming can be found at the Slam Tennis site.